Cool Stretch - Night Splint. Studies have confirmed the effectiveness of using night splints for treating plantar fasciitis. Cool Stretch was designed to encourage patient compliance with a lightweight and comfortable night splint. Coupling passive stretch capability with cold therapy to reduce inflammation, Cool Stretch™ provides an improved treatment protocol for patients. Other features include Sealed Ice™ pack for cold therapy to reduce inflammation and toe lift for toe extension and additional stretch. Effective treatment for plantar fasciitis, Achilles tendinitis, plantar flexion contractures, and equinus or tight triceps surae. Other related products for treating heel pain include Heel Hugger, Heel Hugger with Magnets, Soft Stride Bone Spur Pads, and Polar Ice. I thought this would be the best choice, but I was disappointed because it did not fit properly and I am average size. I can walk in the morning! I can walk in the morning! My plantar fasciitis is not healed, but I do much better in the morning if I wear my splint overnight. This item did not help with the heal pain as much as I had hoped. Easy To Use. Stabilizes. Comfortable. I have used this splint for 1 week with an ice pack. I am going to use it without ice pack. I suffer from heal bone spurs on both heals. After only two nights sleeping with my Cool Stretch Night Splint, I'm experiencing a SIGNIFICANT improvement. A huge reduction in pain not only when I first get out of bed, but all day long. I haven't even tried the ice pack yet. It's comfortable and no trouble sleeping with it. Long term review will follow in a month or two. 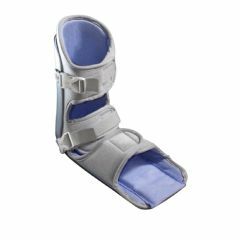 Is it possible to order replacement ice packs for this boot? I'm seeing reviews where the straps are too short. Is this true? I've seen several reviews where people complain that the ankle strap is too short. I have not had that problem; however, the calf strap is too short for me (I do have big calves). With the buckle though, it will stay in place, I just can't get the soft, velcro part all the way around. I have the large men's version, and I think the straps are actually too long. I've been thinking of cutting them shorter. What size should I order...I wear a size 7 1/2 womens...is that a med. or small splint? I wear a size 9 womens, and the medium is a bit too big on me, but useable. Can you use this product for sleeping at night comfortably with a surgically repaired Achilles tendon and it give the support that you need?